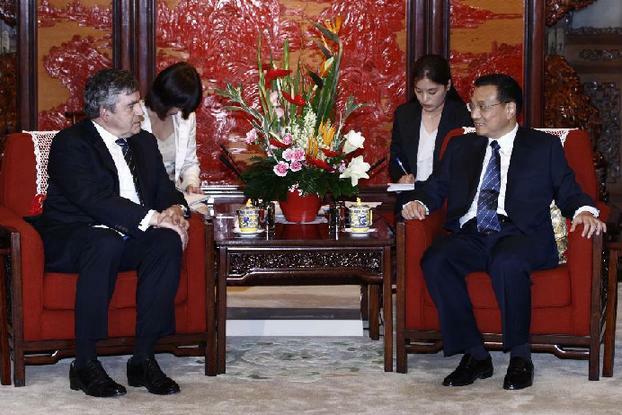 Until fairly recently Li Keqiang had done surprisingly little foreign travel for a senior Chinese leader. Most other members of the Politburo Standing Committee, the nine most important leaders in China, travel extensively and often meet visiting diplomats. But not Vice-Premiere Li, who has generally kept a fairly low profile. However, over the past year this has begun to change, and it’s pretty likely this has something to do with Li’s expected promotion to the position of Premiere in 2012 when Wen Jiabao retires. Only this week he met with both former British Prime Minister Gordon Brown and President of the China-Britain Business Council, Sir David Brewer. Both meetings were pretty soft, with both sides giving each other a metaphorical slap on the back and certainly not discussing any awkward issues like Tibet or human rights. This, and the fact that the meetings were at the invitation of the Chinese People’s Institute of Foreign Affairs, can’t help but make me think that they were a diplomatic warm-up exercise for the Premiere-in-waiting. Of course, they could also be a chance for Li to get back in the saddle after his disastrous visit to Hong Kong in August. Many Hong Kong residents saw the visit as symbolic of Beijing’s attempts to exert more direct influence over the Special Administrative Region and a string of protests were organised to coincide with Li’s major appointments. These protests and the heavy-handed tactics used by Li’s security to deal with them brought about a major public relations nightmare for the Chinese government, but one incident in particular left a significant stain on the occasion. On the 18th August, the final day of Li’s visit, he arrived at Hong Kong University at the invitation of the school president, which led to the university being put on full lock-down by the Hong Kong police. Despite Li stating that he had come to Hong Kong to “look a lot and listen a lot” to local people’s concerns, students and alumni were prevented from speaking to him and three that attempted to approach the Vice-Premier were tackled to the ground by police. One of the students, Samuel Li Shing-hong, was even locked in a staircase for an hour, an act which constitutes false imprisonment. This incident, which has become known as the “Hong Kong 818 Incident” has prompted further protests, as well as a call for the resignation of police commissioner Andy Tsang. 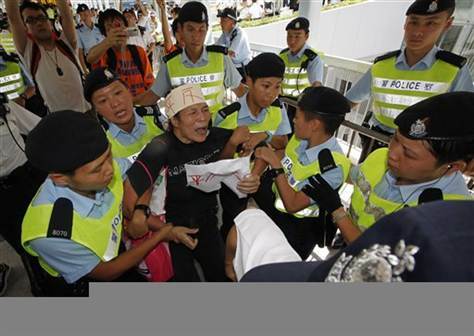 Even members of the pro-Beijing movement in Hong Kong have come out against the police tactics used during the visit. Whilst Li is expected to become the next Premier, it is by no means a certainty at this stage. He has already been beaten to the post of President by Xi Jinping, despite being a close ally of Hu Jintao, and a few more public embarrassments like this could put a serious dent in his career. But at least his time in Hong Kong has given him a taste of what to expect when he encounters Tibetan freedom protests on future trips overseas, as he is going to see a lot of them. This entry was posted on 21/09/2011 at 11:09 pm and is filed under Uncategorized. You can follow any responses to this entry through the RSS 2.0 feed. You can leave a response, or trackback from your own site.